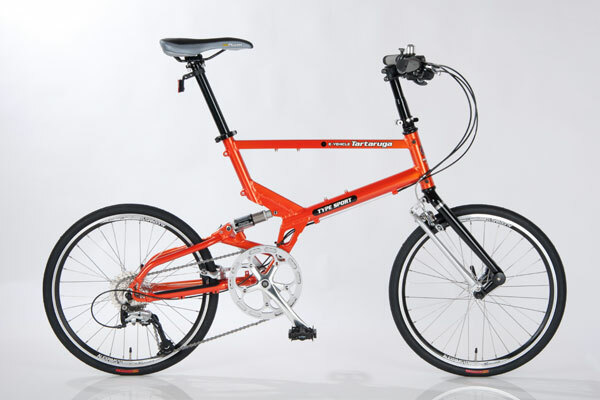 Type SPORT concept is the SUV(Sport Utility Vehicle) of bicycles. Type S features high pressure fast rolling 20 inch wheels and has fit and speed performance similar to a full sized bicycle. It is light, fast and folds! We use a very unique and original suspension system for the rear and front for vibration damping creating a stylish and rigid alloy frame with a soft ride. 'Stiffness but Soft', it is a very unique riding feel. Extensive initial testing and development has gone into the front and rear suspension to achieve the unique balance and ride quality offered on the current Type SPORT. The suspension works together to dampen the vibration from the road normally but also works to absorb bigger impacts, like an edges between road sections or on and off sidewalks. This means, we simulate the riding feel of bigger fat tires from the tuned function of our original suspension system. 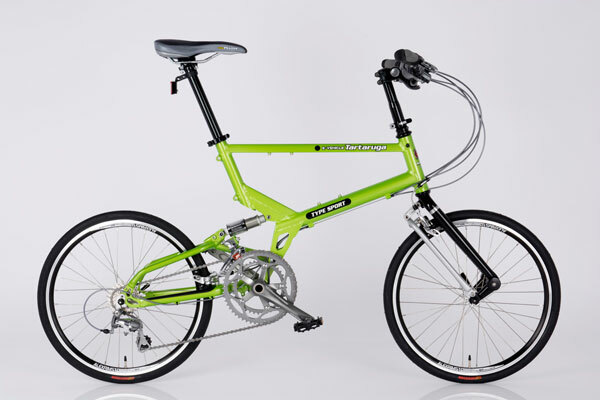 Type SPORT features a Unified Rear Triangle (URT) rear swing arm; having the pedals and rear wheel in the same structure, this creates very efficient pedaling without any loss energy into suspension movement. Also Type SPORT has a very smooth and neutral handling feel, so you can always be in control of the line you want. The unique riding feel called 'Stiffness but Soft' is created by all of these very exquisite frame features for overall balance. Custom select Wide Adjustable Riding Position. A wide range of different riding position can be selected, through combinations of the high rise handle bar and adjustable stem. An all in one vehicle according to your feeling that day. The stem can be set sporty with a forward-down position, and then a wide view and comfort height can be selected when you choice the most upright riding position. 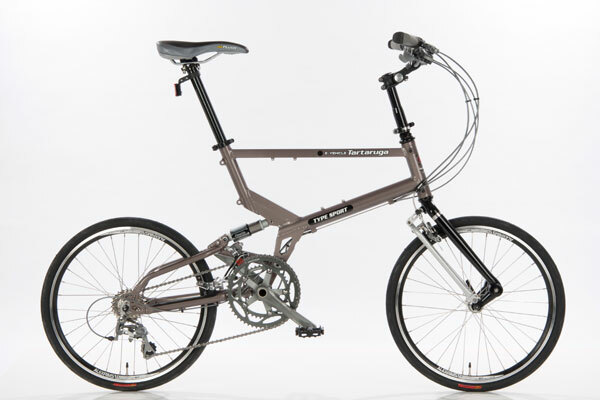 Type SPORT is can be many style from its versatile features; You can ride a high performance suspension bike by a comfortable position like 'Mamachari', and can load with luggage firmly on the rack. Tartaruga Type SPORT is the best bike for realizing your "I want to do". In general, it seems that if one product can do everything there are compromises at each function. With Type SPORT, Tartaruga's focus on all details to the very end brought together in balance a miracle of all great features. We recommend with confidence Type SPORT for everyday use for any situation you feel. Vibration damping suspension front and rear has the function to absorb vibration from the road and high pressure tires. And it can be added enough utility to use the some mount on the frame by optional parts installed. 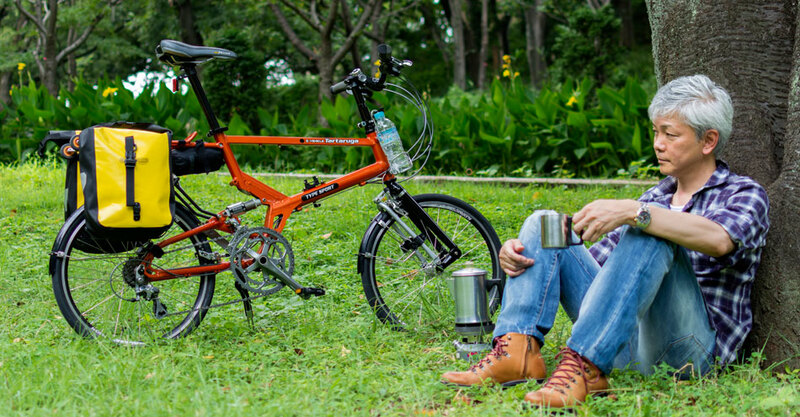 Type SPORT is a collaboration model between Pacific Cycles, Taiwan and Tartaruga Entertainment Works. 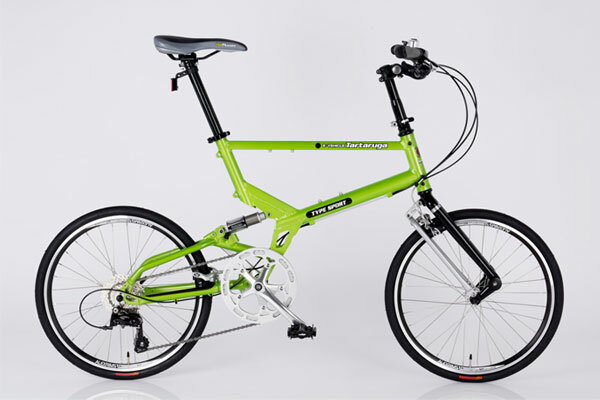 Pacific Cycles is the manufacturer of many famous small wheel bikes worldwide including the whole Tartaruga series of bicycles. Drawing on Pacific Cycles vast passion in development of ideal small wheel bicycle fit and ride geometry, Tartaruga started with Pacific's ideal base geometry added our original ideas and crafted Type SPORT unique style and feeling. Through our collaboration a great riding performance, multiple versatility and style was fashioned. It's fodable, and 2 different folding style available! Type SPORT full size ride that amazingly be folds quickly without any tools. Simply release the wheel quick release and remove the tires, release the shock from the swing arm under the main frame and remove the seat post and handle bars. 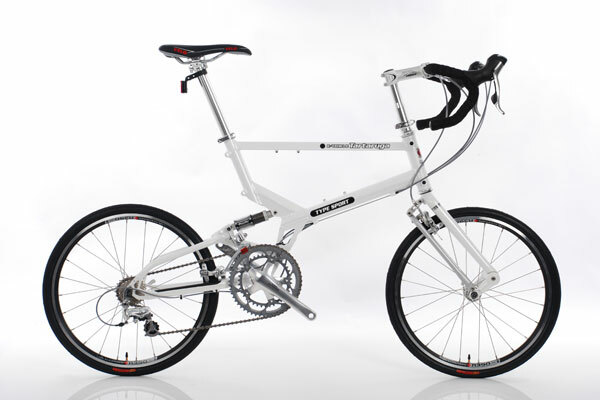 The final arrangement of frame and parts will compact into a very thin easy to transport bag ready for your journey. Even our optional rear carrier is a genuinely unique in design and convenience. The rear carrier automatically tucks away as the swing arm is released and folded under the main frame. 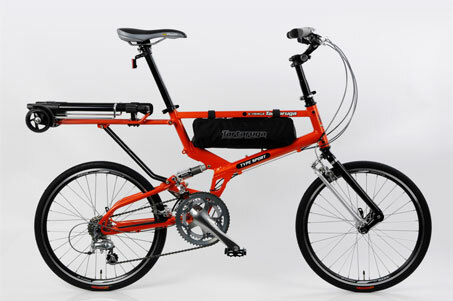 Amazingly, the folded size remains is the same as without the rear carrier. With the use of our optional 'Easy folding adapter' and 'rear carrier', folding size is slightly bigger than complete folding, but it allows for a quick convience folding. Also, all removed parts can be snaped on to the frame, so you can carry Type SPORT without transport bag. Folding and unfolding demo video available for Window Media Player, HERE. Mac, iPhone, iPad or others available HERE . Mac, iPhone, iPad or others available HERE. Type SPORT has wonderful riding performance that is stable, light and fast. With optional carriers install it has enough carrying capacity for even your most adventurous excursion. Being an adult allows for open choice for where your day leads. Riding Type SPORT allows you to go as your whims desire. And if you get too tired or far away, you can easily fold it up, find a local transport to whisk you back home. You can get more information about optional parts for Type SPORT HERE. 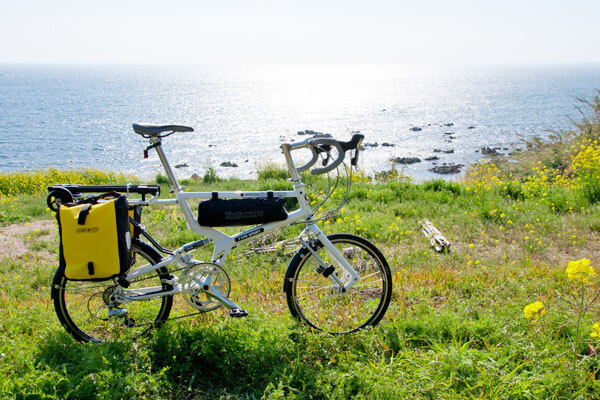 Type SPORT the long touring bicycle grade. Now launching as a special raundner grade Type SPORT Grand Touring, it is a new generation of type of 'Raundner'. You can get the information about Tartaruga Type SPORT Grand Touring HERE. 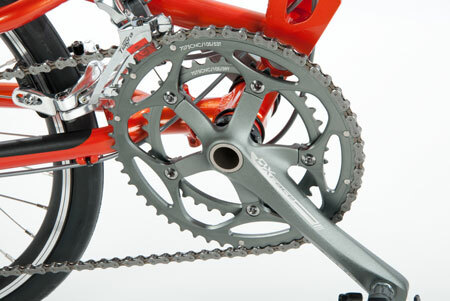 We up graded the drive train of Type SPORT DX model. We used 'DX racer' whtch high grade model of DriveLine to Type SPORT DX model on based 20 speeds Shimano 'Tiagra' from latest production. The crank is simple and sporty model with Ti color, it's lighter and more rigid than the Shimano 'Tiagra' original. Also we installed 53T front chain ring, so the DX model can be get more speed and more rigid pedaling with highly rotate special hub. It can be run smooth well for all users! Type SPORT has great features, and we found even more ways to improve over the previous model. When releasing the brake side lever, sometimes various brake shoes would still touch a fully inflated tire demanding extra force be used to remove the wheel. We modified this dissatisfying point completely in the latest lot of Type SPORT ver.1.25 of all models with a new type side lever. 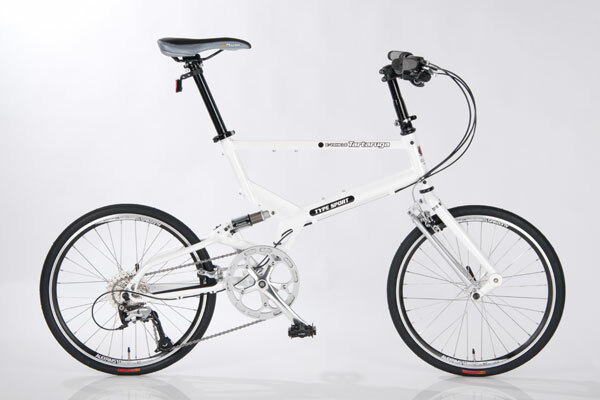 The DX model and GT model even features our own custom brake that we have added additional crafted CNC work to further enhance new ease of use with standard available brakes. Now we are proud you can install the wheel freely and the rearrangement has also improved the positioning of the brake arms that yield a more firm and controlled braking feeling of a high class racing model. Type SPORT DX is our new flagship model featuring Shimano TIAGRA components with 20 speed drive train. 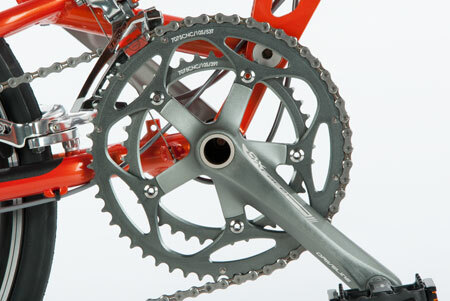 We up graded the crank and BB to 'DX racer' of DriveLine, also front chainring changed to 53T. 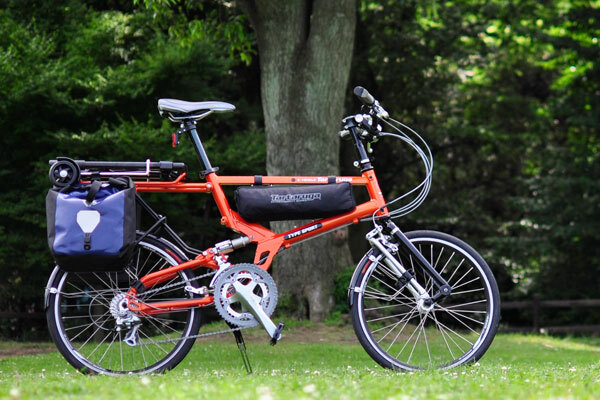 This model is really well suited for city use and even great on long rides up and down the ridges. This is truly a best buy model with its balance between performance parts and price. You can get specification about 'Type SPORT' HERE. 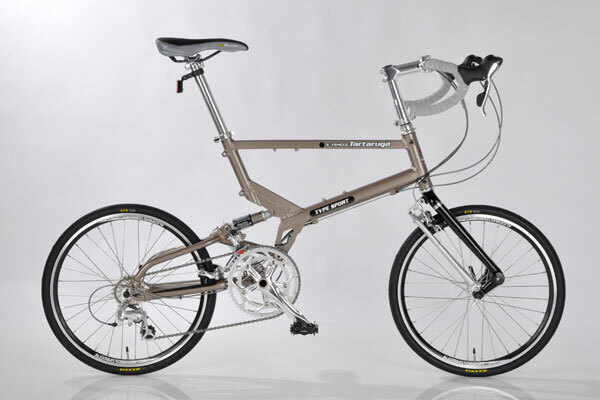 Type SPORT GT is our 'Raundner' model featuring Shimano SORA components with 18 speed drive train. Main differences with DX and SD grade are: Drop handlebar, Integrated brake lever with Index shifter, and high performance high grip tire with sled. These distinguished points create a new performance that can be called the NEW generation type of 'Raundner'. You can get the more information about the Tartaruga Type SPORT Grand Touring HERE. You can get specification about 'Type SPORT' HERE. Type SPORT SD is our entry level model featuring Shimano SORA components with a single front chain ring and 9 speed rear gearing. The SORA group is very well suited for best performance in and around the city. You can enjoy the city from top to bottom at any speed you desire in comfort and style.